i set myself up for disappointment. i should have known that i couldn't have expected a great ramen to come out of a sushi restaurant. it takes HOURS of simmering pork bones to make a proper ramen soup base. and just like i can't expect an exceptional bowl of pho at mai's, the same rules should apply for a sushi restaurant. ramen is listed simply as "japanese ramen" on their menu. when ordered, our server asked me if i wanted miso, soy sauce, or tonkatsu. i chose the soy sauce (shoyu) version that i enjoyed so much at santouka. when the bowl arrived at the table, i was pleasantly surprised. 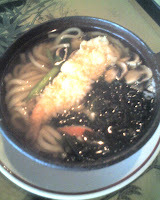 the broth did look a little milky like santouka's version and i saw tiny, tiny dots of grease swimming on top. this made me hopeful. my first bite was overwhelmed by the flavor of bamboo shoots. so i took them out and mixed it all up a bit. i found half a boiled egg in there and lots of chashu pork. the pork looked soft and fatty. there was also plenty of nori, green onions, and bean sprouts on top. mixing didn't help much. there just wasn't enough flavor and complexity in the broth. the noodles weren't toothy enough. the only redeeming item in my bowl was the chashu. it was tender and buttery and there was plenty of it. at santouka, i only had a small slice of chashu but i ordered the small bowl there. michael, who read my ramen quest posting and called me b/c he wanted to come, ordered the nabeyaki udon. 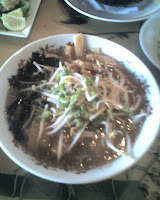 the broth was light with a slight smoky flavor and the noodles were gummy as expected. it came with a tempura shrimp floating on top of the bowl. i forgot to tell them to bring it on the side. 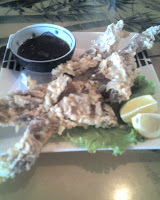 we started out with a wonderful soft shell crab appetizer w/ ponzu dipping sauce. the crab was huge and so a few bites were a bit roe-y. is that a word?